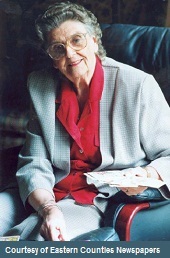 Sadly, Joyce passed away in November 2010. She will be remembered fondly by many as a great figure and inspiration to those that had the privilege to know her. I had the pleasure of knowing Joyce for many years and regarded her as great friend. Her sincerity and kindness will be truly missed. This website remains as a tribute to Joyce and her dedication to her life’s work. Limited number of Joyce's own books available - these were her own personal copies she kept herself for sale. More details here. 'We've got printers' ink instead of blood in our veins,' my grandfather told me. He had lifted me on to his lap and I was gently stroking the blue veins on his old hand. Later I deliberately cut my finger to find out if blue ink came out. It didn't. I got a scolding and a sticking plaster was put on it. But as soon as I learned my letters I started to write, like all the other Hartleys--my family name--who then thronged Fleet Street. We have almost all been journalists and writers, since our forebears became Quakers in the early eighteenth century. In a big family conference, they decided to 'give away all for conscience sake,' They decided they 'preferred an honest living to inherited wealth,' and should work one way or another, according to their abilities. Words have always been mankind's playthings, and I have enjoyed the game of words, the interplay of ideas, thoughts and experiences, from the trivial to the deeper expressions of the heart and mind, all my life. And from the complexity of youthful concepts and views, to the greater simplicity of old age, is a long, long path. My website contains the essence of my life's work, in CALL NO MAN MASTER: what I did in my 50-60 years following Gurus and teachers, to THE PATHLESS LAND: what I thought about it all in the end. There are also historical and other novels etc. My most recent published book OF FIRE AND MUSIC, was first conceived years ago, crossing Loch Dunvegan with Dame Flora MacLeod of MacLeod, 28th Chief of the Clan MacLeod, and other house guests at Dunvegan Castle in Skye. I wrote it in the end for her grandson John, 29th Chief. Sadly, although he chose the title and was supportive, he died in 2007 before he could read it. May you read and enjoy, as I have enjoyed my many years of writing and living.